When it comes to popular destinations in Morocco, the city of Marrakech is a well known place to visit. 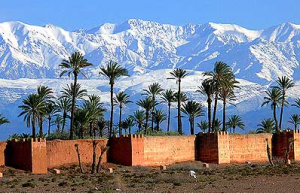 The Imperial city of Marrakech is located at the foot of the Atlas Mountains, 148 miles south of Casablanca. It is filled with historical and fascinating architectural structures. Also, this city is often called the cultural center of Morocco; some of the popular attractions there are as follows. Djemma el Fna is a large square located in the old city of Medlna. During the daylight hours, this is a good place to grab a snack; at twilight, it turns into an entertainment paradise. If you are interested in juggling, music and snake charming, consider spending an evening there. The Majorelle Gardens is a popular attraction located in the middle of the Marrakech new town. Majorelle is known for its colorful flowers, plants and ponds. In addition to the garden, on the grounds you will find the blue and yellow Islamic Arts Museum. This structure houses various unique types of Moroccan tribal art, pottery and jewelry. The Saadian Tombs are the final resting place for the Saadian Dynasty, that ruled southern Morocco during the 16th & 17th centuries. These tombs were created by Sultan Ahmed Al-Mansur for his family. This popular attraction is located in old town on the grounds of a peaceful garden. If you enjoy shopping and bargain hunting, you will enjoy the Souks. Visitors will find a market that sells a varity of goods. The Souks are north of Djemma El fna; when navigating the alleyways, be aware it can be tricky to navigate; take your time and or hire a guide. If you enjoy visiting jewelers, spice merchants or metal work shops remember the Souks. One of the best examples of Moroccan architecture is the El Bahia Palace. This structure was built during the the late 19th century and was intended to be the best palace of its day. Like other buildings of the period, it was intended to capture the essence of the Moroccan style. El Bahia features interesting and unique arches, details and engraving. This is a must see attraction in Marrakech. The Ali Ben Youssef Medersa Mosque was constructed in the 16th century by the Saadians. This is the largest school of its kind in North Africa. In the 1960’s, it was closed and later refurbished & reopened as a historical site in 1982. Ali Ben Youssef is a beautiful structure that once housed 900 students; if you are in Marrakech, this is a great place to explore. If you desire to visit a museum and palace in one, Palais Dor Si Said is a good attraction to see. This place is is known for its beauty and picturesque courtyard. In addition, it houses the very quintessence of Moroccan art too. On the ground floor you can see costumes, objects in beaten copper, jewelry and ceramics.